The perfect mix between dressy and casual! The Pretty in Peplum Dress & Top will add a little class to your knit sewing, without sacrificing comfort! 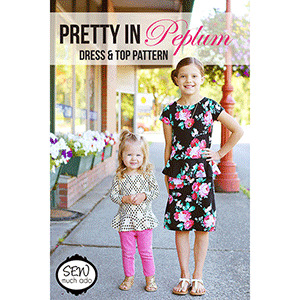 The pattern includes options for both a dress and top that are easy to dress up or down. 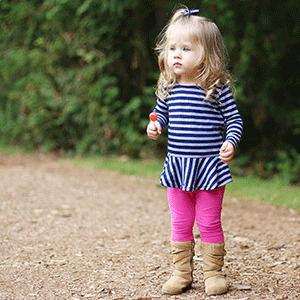 Choose long, ¾ length, or short sleeves, and keep your little girl in style all year long! 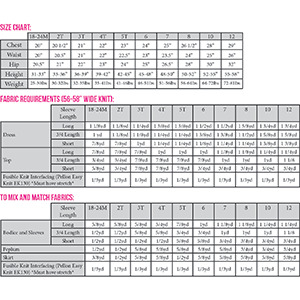 This pattern comes with sizes 18 months through 12 years. Suggested fabrics are light to medium weight knits with good stretch and recovery such as cotton jersey, cotton lycra, french terry or ponte de roma.